The staff of State Border Guard Service together with the law enforcement agencies conduct the events on counteraction to illegal movement by the illegal migrants across the state border. Thus, in the framework of the joint special border operation “BORDER-2018” and the target preventive measures “Migrant”, inter-agency group, consisting of operational staff of the State Border Guard Service, representatives of the National Police and the State Migration Service, on the highway “Kyiv-Chop” on the outskirts of the village Velyki Lazy in Transcarpathian region stopped the van “OPEL ZAFIRA” of Polish registration driven by the citizen of the Russian Federation, in which he was transporting 6 undocumented persons, who introduced themselves as the citizens of Afghanistan. The detained persons were delivered to the Border Unit “Uzhhorod” aiming to conduct filtration and verification actions. During interview the foreigners reported about their plans on getting the EU countries beyond the check points. The RF citizen was arrested under the Art. 208 of the Crime Code of Ukraine (Detention by an authorized official) by the representatives of the National Police in the Transcarpathian region. This entry was posted in Translated Media-News from Ukraine and tagged Detention, migrant, Migration Service, Transcarpathia, Ukraine, Uzhhorod on August 26, 2018 by oksana. 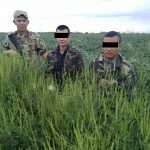 Realizing information of the operational units, the border detail patrol detained three foreigners on the road between the villages Bars and Bunyakyno, Putivl district . The persons had ID cards of the citizens of the Republic of Cuba. Previously it was established that the offenders arrived to the territory of Ukraine illegally outside the check points crossing the Russian-Ukrainian border swimming it across the Seim river. Currently, the offenders are delivered to the Border Unit “Bilopillya” for drawing up administrative materials. The relevant law enforcement agencies are informed. This entry was posted in Translated Media-News from Ukraine and tagged Republic of Cuba, Russian-Ukrainian border, Ukraine on August 25, 2018 by oksana. In order counteract illegal migration and violation of the stay rules by the foreigners within the territory of Ukraine a complex of practical events are planned in some regions of the country. Joint servicing of the border guards together with other interacting agencies are organized in the areas of possible unlawful actions. The previous day, the agents of the Border Department together with the staff of Mohyliv-Podilks, Ismail, Kherson, Mostysk Detachments and representatives of National Police and State Mgration Service detained 7 foreigners in the frames of above mentioned preventive measures. These were – the citizen of Jordan and frou persons from Azerbaijan, who violated the stay term on the territory of Ukraine, the citizen of Armenian, who had forged stamps on border cross, and the citizen of Cameroon having no any documents. The appropriate materials were drawn up as to the violators under the Ukrainian legislation in force. 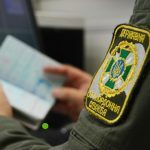 In total, since the beginning of the operation “Migrant” the staff of SBGSU prepared more than 1240 protocols only for the foreigners’ offence and stateless persons violating the stay rules in Ukraine and transit trip through the territory of Ukraine. in addition, the violators of the Ukrainian legislation were fined for the sum of 11.1 mln UAH. This entry was posted in Translated Media-News from Ukraine and tagged Armenian, Azerbaijan, border, Cameroon, cross, illegal migration, Jordan, legislation, protocol, stateless person, Ukraine on August 22, 2018 by oksana. During the documents verification of the tourists from the bus, one of the passengers presented the travel document of the Italian citizen for passport control. However, the inspector had some doubts about the authenticity of their documents. It was established that the Italian passport was completely fake. The foreigner in this way tried get through Ukraine to one of the EU countries. The traveler confessed to have the citizenship of Ghana. 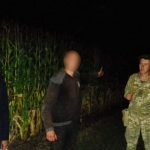 The offender was detained and taken to the Lviv Border Detachment for clarification of the circumstances in order to initiate an administrative offence under article 204-1 of the Administrative Infringement Code of Ukraine “Illegal cross or attempt to cross illegally the state border of Ukraine”. This entry was posted in Translated Media-News from Ukraine and tagged EU, Ghana, Ukraine on August 19, 2018 by oksana. The activities are conducted to prevent violations of the law on legal status of the foreigners and persons without citizenship, to combat illegal migration and violations of the stay rules for the foreigners on the territory of Ukraine. 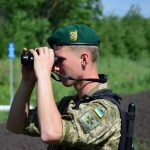 Currently, a complex of practical actions, including joint patrolling, is performed in the controlled border areas and possible areas of illegal activity by the State Border Guard Service jointly with the National Police, State Migration Service of Ukraine and Security Service of Ukraine. In a result of these actions performance the agents of the Western Regional Unit of SBGS together with the staff of the National Police of Ukraine in Lviv region detected 5 foreigners – citizens of Vietnam. Preliminary information about that persons, who were preparing for the illegal cross the state border to EU countries in the area of responsibility of Chop Detachment was received by the operative units of the State Border Guard Service. In the course of data working off the likely offenders were found in one of the hotels in the town of Khodoriv, Zhidachiv district. The foreigner had no any identifying documents. Currently, the law enforcers conduct investigation actions. This entry was posted in Translated Media-News from Ukraine and tagged Chop Detachment, Lviv, Ukraine, Vietnam on August 18, 2018 by oksana. The law enforcement officers continue to use a range of effective measures to counter illegal migration across the state border of Ukraine. 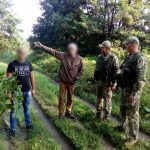 So, the border guards of Sumy Detachment together with the staff of the National Police in the frame of the joint special border operation “Border-2018” and target preventive actions “Migrant” detained illegal migrants being accompanied of the Ukrainian citizen. In the course of previously received information from the staff of the Operative ad Searching Units of the SBGS about possible unlawful activity, the joint detail of the BD “Krasnopillya” and Head Department of the National Police in Sumy region nearby the village of Turiya by means of the thermal surveillance device detected and revealed the citizen of Ukraine, who attempted to smuggle the citizen of Azerbaijan from Ukraine to the Russian Federation. Both men did not have any identity documents. Now, the citizen of Ukraine is established – he was a local inhabitant of one of the villages near the border. The detained offenders were delivered to border unit for carrying out filtration measures and preparation of all necessary administrative and procedural documents. 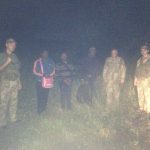 This entry was posted in Translated Media-News from Ukraine and tagged border, citizen, Russian Federation, Ukraine on August 18, 2018 by oksana. The man is from the faraway Lebanon, the woman is Ukrainian. As reported by detainees, they had lied for a while in the West Asia, then in Ukraine. However, they subsequently decided to seek his fortune in the vast Western Europe. The border detail of the BD “Stuzhytsya: stopped the travelers 10 m before the Ukrainian-Slovakian border. The detainees will be called to administrative responsibility under part 2 of article 204-1 AICU “Illegal cross or attempt to cross illegally the state border of Ukraine”. This entry was posted in Translated Media-News from Ukraine and tagged Lebanon, Ukraine, Ukrainian, Ukrainian-Slovakian border on August 16, 2018 by oksana.